Wits offers on-campus assistance to students who are sexually active. Wits University offers support at various stages of a student’s pregnancy which includes counselling, referrals to clinics, and information on abortion services. Sister Maggie, head nurse at WHC, and head of the department, said that the centre deals with many pregnant students on campus. “We consult with them and then refer them to antenatal care units,” she said. Pregnant students who live in residences are asked to leave their accommodation at 32 weeks as “they need to go home so they can be monitored by [a parent or guardian] before they give birth”, said Moloi. In instances where students request abortions, Moloi said the WHC refers the cases to outside clinics. “We deal a lot with abortions. We provide counselling but do not do the procedure ourselves. We refer the students to Hillbrow or any other clinic of their choice,” she said. She added that most clinics are free of charge but abortions are charged for at Marie Stopes Pregnancy Termination Clinic, which offers legal abortions to patients up to 20 weeks. “Students usually go to Marie Stopes as they are open on Saturdays,” she said. *Sarah Jackson, a Wits graduate, was pregnant twice during her studies at Wits. She was a second-year BSc student when she fell pregnant for the first time and Jackson said she did not know where to request special parking and was too embarrassed to ask. Her second pregnancy was a different experience. She was a postgraduate student at Wits Business School (WBS) and said that during her studies she “had a more pleasant experience and found [Wits Business School] to be very understanding”. Naidu said, “The number of pregnant students accessing our services does not warrant an exclusive programme” adding that CCDU runs programmes offering guidance for students who are sexually active. All these forms of contraceptives and consultations at the WHC are offered free of charge, according to Moloi. 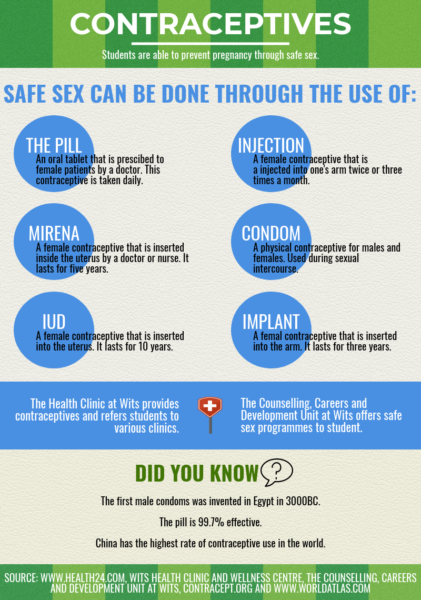 For certain contraceptives, such as the mirena, the clinic does not run the procedure but refers the student to an appropriate clinic.